BBC 5 Live Interviewing Christleton students about the upcoming General Election. They are shown in the picture with BBC reporter Sam Walker. Five, brave and passionate, Year 13 students were interviewed live on air to discuss the upcoming General Election. They discussed whom they would vote for in their first election and what issues they thought would decide the outcome. 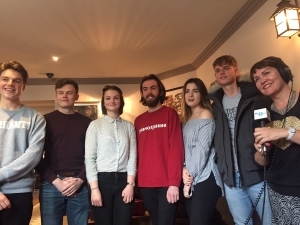 Max Abrams, Tom Lefebure, Angharad Rees-Hughes, Adam Stanworth and Fraser Drummond-Hay all spoke eloquently and with authority to both the BBC, Radio Merseyside as well as to the Chester Chronicle. Well done! We look forward to seeing some of you pursue a career in politics in the future.